The Coliseum rises among the Palatine hill, the Celian hill and the Oppian hill. Its construction was begun by emperor Vespasian and was completed by his son Titus in 80 A.D. At first, in the amphitheater, gladiatorial shows, consisting in fights to the death between men and beasts, took place: it is there that, later on, the first Christians were cruelly killed by beasts. 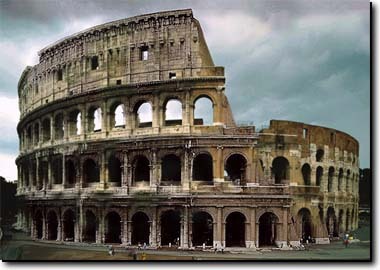 Afterwards the Coliseum was neglected, which provoked its rapid deterioration. Pope Benedetto XIV's edict consecrated it to the memory of the Christian martyrs, putting an end to its slow destruction. In 1808 it was restored by Pope Pious VII. The Coliseum consists of four floors: the first three of them have 80 holes shaped like archs, while the fourth is taller than the others and is characterized by a more compact building mass with windows. The archs are separated by pillars with semi-columns of Doric, Ionic and Corinthian order. Inside, the staircases had a capacity of around 50.000 people, who, in case of bad weather, were sheltered by a system of coverage consisting of striped cloth, maneuvered by one hundred sailors. It is the greatest amphitheater of the Roman world.